My beautiful daughter by the Christmas tree! My daughter took many of these photos and Sam took a few also. 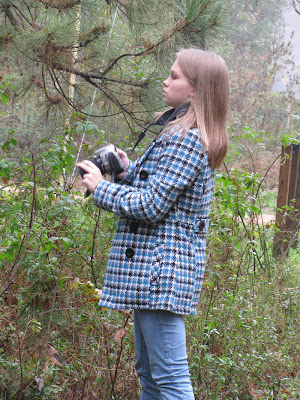 Savannah is now a budding photographer herself so even though she just got her first nice Canon camera last year, she likes to take and use my yet more expensive camera... She is taking photojournalism at school and has her own blog and is very talented! 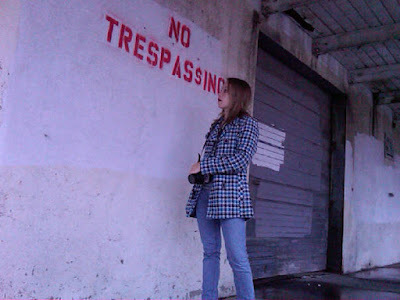 She is much better at photo editing than I am, so these are just some shots I barely edited. She'll have more on her blog soon. We went to see Avatar on Christmas Adam (Adam came before Eve... ha ha!) - and we all loved it. We didn't see the 3D version, but I'd like to if I see it again. Here's the skinny on Christmas - but below are the pictures that tell the story. Christmas Eve I baked my homemade pies - pumpkin and apple - and made a broccoli casserole (which nobody liked but me... but I love this casserole and now I have a huge bunch of it - ha!). Then me, Doug and the kids went to church around 6pm, which was a really nice festive service. After church, we came home and watched It's a Wonderful Life while eating a bunch of random hors d'oevres like baked brie, chips and queso, strawberries with chocolate fondue, summer sausage, hummus and naan bread, and chicken salad with crackers. Yum! 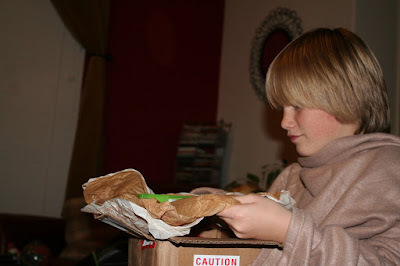 The kids opened one gift each. When the kids went to bed, we packed up their stockings with Santa gifts and then Doug and I watched Lost... We're on the last season out on DVD. I love that show! Christmas Eve we got up relatively early and the we all opened their stocking gifts and we ate pie for breakfast (what else?). Next we opened all the gifts under the tree, one at a time. 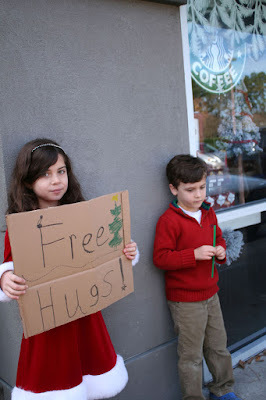 The next big plan for Christmas was to have our 2nd annual FREE HUGS event at Starbucks. 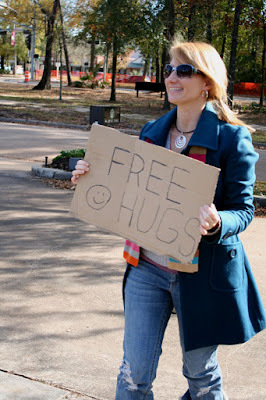 Last year my ex had the kids so I had wanted to do this ever since I saw the Youtube video and heard about the FREE HUGS campaign. I had just started dating Doug so I roped him into doing it. Ah the things you can do with new love... this year I had to rope the kids into doing it with us. 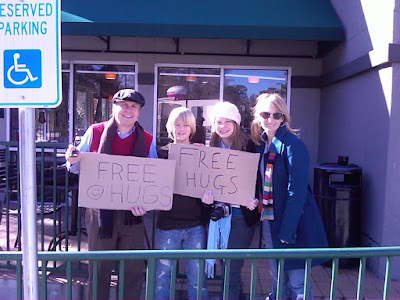 It's funny, Savannah was all excited about doing it if her friends would come, but of course on Christmas few people are around to go stand at Starbucks and give out free hugs. So she didn't want to go. She thought it would be embarrassing. So we went to a Starbucks a bit further away from our house to minimize the chance she'd encounter someone from her school. Ha! But once we got there I think everyone had a good time. My friend Georgia and her family came again this year. After we were done with that, we came home and I cooked up a pork tenderloin, mashed potatoes, gravy, sauteed mushrooms, corn, and stuffing. I had made the broccoli casserole the day before but forgot to put it in the oven - oops! We prayed and gave thanks, and stuffed ourselves. Then we watched the movie Cloverfield, not exactly a Christmas movie but what the heck. Doug wanted me to see it. I got very sleepy... probably all the food and the chocolates I kept eating after dinner! 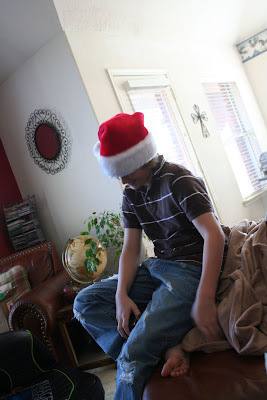 All in all it was a very good and fun Christmas holiday! Laughter is a beautiful thing! I want that one! Christmas Even everyone picked out one gift to open. 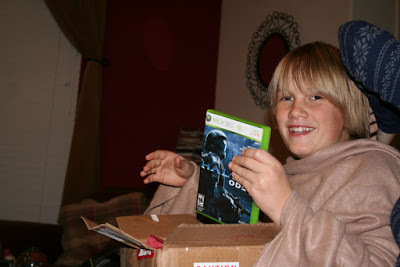 He got... Halo ODST3. Just what he wanted. Plus a cool pair of jeans in the box that even fit and he likes them! 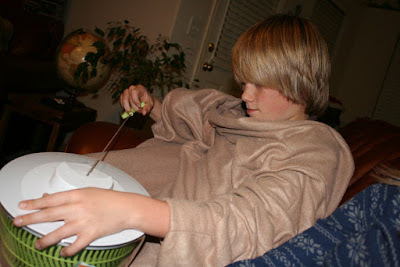 I opened my gift too - a salad spinner from Doug! I've wanted one forever! But Sam liked it best of all. He would not stop playing with it! Christmas morning! About to open stocking gifts. 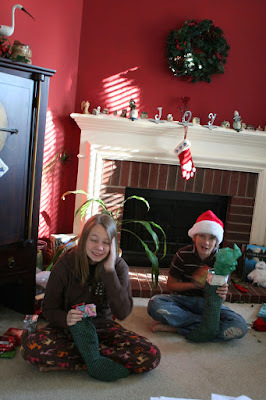 I sewed their two stockings many years ago from fabric from a maternity dress. 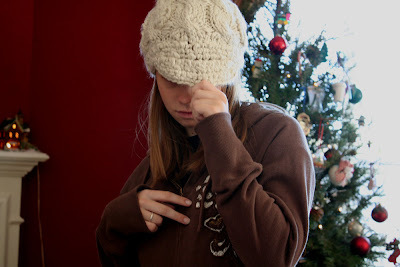 I got Savannah this hat from Buckle, which she loves and looks soooo cute in! 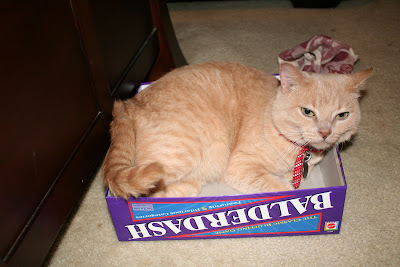 The cat got her present - the Balderdash box. She loves boxes of all types. 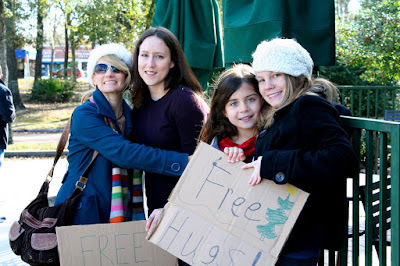 On to Christmas free hugs! 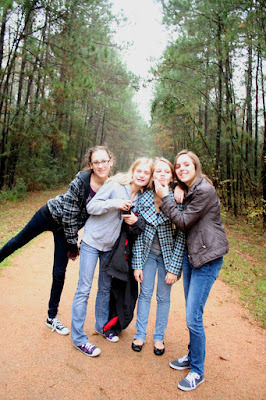 This is me, Georgia, her daughter and Savannah. 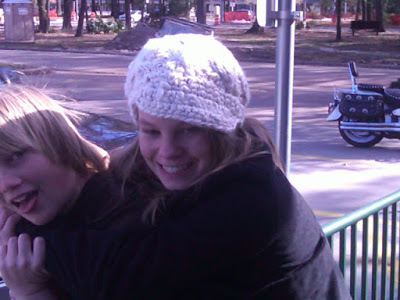 Sam and Savannah torturing one another as usual. Savannah stuck her hand in front of the camera - random just like her! 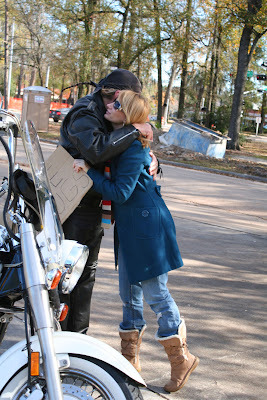 This is a local pastor who loved our free hugs campaign. He had us take a picture and send it to him. M and Savie. So cute! 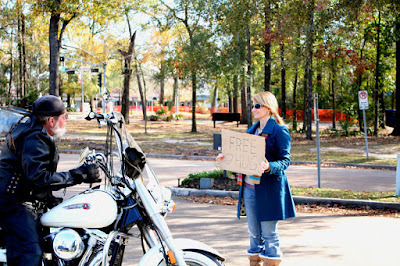 M and L bringing the Christmas spirit to the Free Hugs campaign! 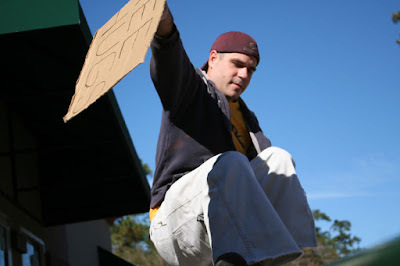 Doug decided to run around the parking lot screaming, "Just give me a damn hug already!" while jumping around like a madman. Savannah recorded it on video. It was hilarious!! Would you like a hug? We are equal opportunity huggers! Right now, I feel bliss. It's 145 in the morning, and well I have just have a warm happy feeling. Bliss. I haven't been so good about blogging regularly and I have so much to say, but I'll just add a few thoughts and updates and then I'll try to write more later. Today I took the kids ice skating at the Galleria, which was fun though the skates are annoyingly hard and uncomfortable (they seem to get more so every time I go - do you think?). Doug and I went a year ago the first week we'd met, so it was special to go back there together. Savannah and Sam brought friends and we skated then went to Ninfas for lunch. Surprisingly, the Galleria was not that crowded, given it's the week of Christmas. Speaking of Christmas, doesn't it seem that every year the holiday season goes faster and faster? I am happy to say though that I really haven't stressed at all this season. Last year I didn't get my holiday letter out at all. I wrote it, I bought stamps, and then I never mailed anything. And writing a holiday letter and Christmas cards is a 15+ year tradition for me. Some people think newsletters are impersonal but I disagree. 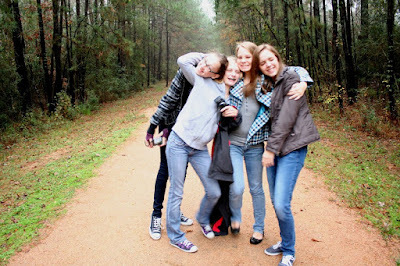 I truly love reading about my friends' years and seeing new pictures, and I know that it can be incredibly difficult to keep up with people on a more regular basis (this was even more true before blogging and Facebook came around). And I like writing one! I am happy to report that I got my tree up and decorated relatively early in the season - and I LOVE the way my house looks with the tree and Christmas decorations. I got my holiday letters written and mostly sent. I have my Christmas shopping all done and presents wrapped. And we have some special things planned for this week. I have the kids this Christmas (my ex and I alternate holidays, so if I have them on Thanksgiving he has them on Christmas and vice versa). I thought about going to Dallas to visit my mom and stepdad but it's my first Christmas with my kids and Doug here, so we decided to stay home and just do some fun stuff. Today was the ice skating part of the plan. We also plan to go to see that new flick Avatar, which looks awesome, probably on Wednesday. 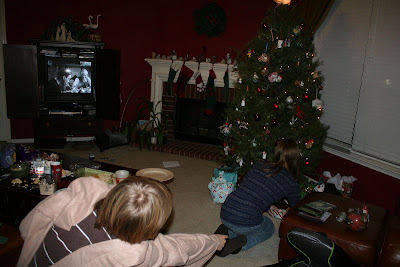 On Christmas Eve we'll go to church and have the kids open one gift each and watch It's a Wonderful Life. Have you seen that movie? Do you love it? Hate it? I've only watched it once or twice and it's so moving, and I'm trying to share with the kiddos some holiday traditions and things. They've never seen that movie, believe it or not. Last year or the year before I had them watch A Christmas Story which of course is a classic and they thought it was totally stupid and cheesy. Course it IS totally stupid and cheesy but that's part of the appeal. Christmas we open stockings, and then gifts and I plan to make a big Christmas dinner with Doug as my sous-chef. Yesterday my best friend Daline came over and visited. 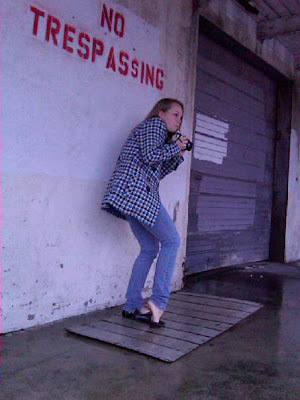 She's been living here in Houston for several months and I've hardly seen her more than when she lived in Cali or Utah! Every year since I've known her she always came to visit me over the Christmas holiday when she'd come home to visit her family. 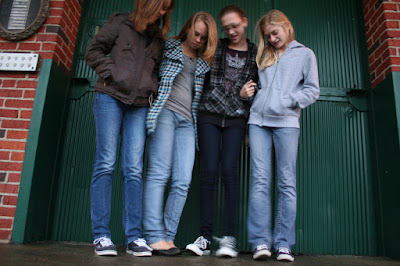 That always meant so much to me since in my life I tend to be the one who keeps in touch with everyone from days past. Daline and I met in college, and have been friends since, and became very close after my divorce. She's been an incredible friend, listening to so much stuff I've rambled on about, and she is just a truly outstanding human being and I am blessed to call her friend. 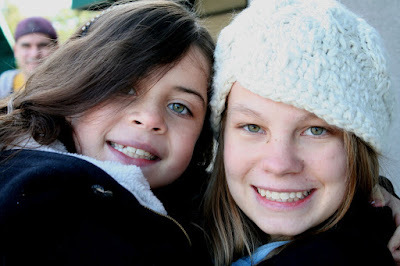 People are lucky to find just one friend like this in a lifetime. And she's an incredibly talented musician!! So we went to a meditation at Ekam Yoga, which is owned by my friend Maggie, and the meditation was led by my friend Linda. It was really neat and combined Qigong, sitting/meditation, chanting and breathing. Then we did a fun little gift exchange (I got a popcorn popper - oops I almost wrote popcorn pooper - ha ha!_, and then there was some absolutely delicious yummy food. Then Daline and I came home to my house and played Balderdash with my kids, and she and I drank some wine, and talked til past midnight! So that's all the tidbits of info I have to share. I have more, but will keep it at this for now! Lots of love to you all this Christmas season. Tonight is the longest night, and tomorrow is the return to light. 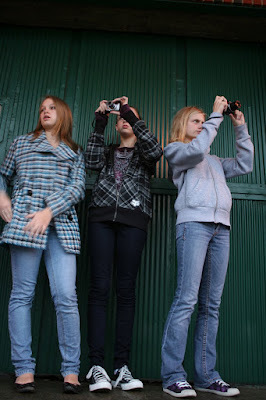 For my daughter's birthday, she wanted to go photograph stuff with some friends. 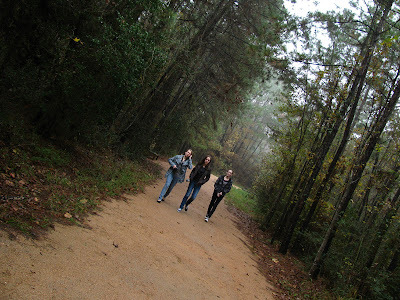 First we went to a nature park. 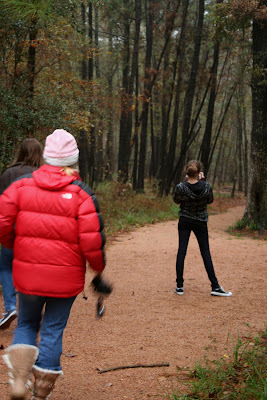 It was a very foggy day, which is unusual for this area, but that added a cool dimension to the photos. 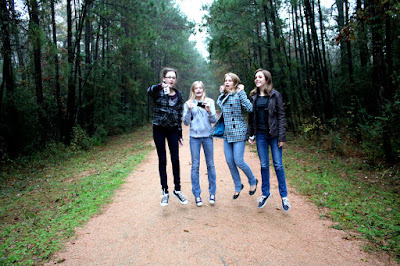 Who knew the girls could levitate? There was a lot of dog poop at the park, and I stepped in it. Twice! 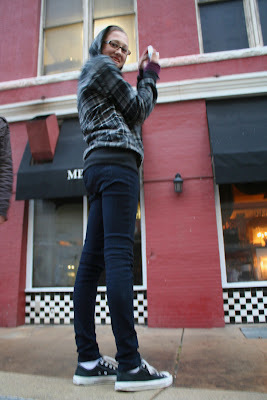 Meanwhile Savi got some good shots. She got this coat for her birthday! Nest we went downtown Houston and took some random photos. 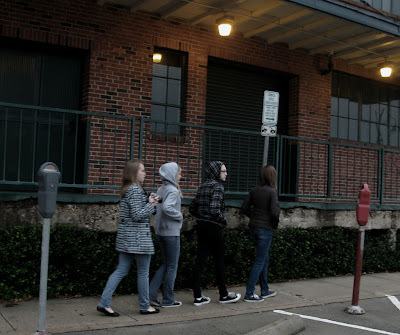 There was a particular old abandoned building just across from Minute Maid Park that Savannah wanted to photograph but after we drove to it, we realized stopping might not be such a good idea. There were several dozen homeless people all around there, several camped under the overpass, several walking around the region. I felt bad for them. It's not always in your face in the suburbs. It was like a tent city but without the tents. This building was really cool. Lots of color and texture. 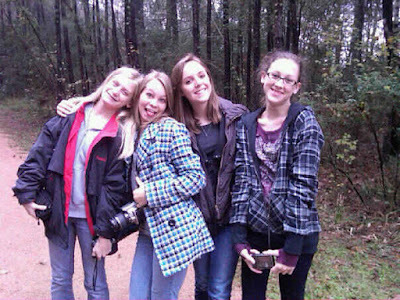 Quit taking pics girls so I can take one of you! The weirdest thing is that inside the window was a paper printed with Lola Savannah. That's my daughter's name and one of her friends' nicknames (well close to it). And it smelled like coffee! I love love love this photo! I edited it slightly in Photoshop by reducing the saturation and the result is it looks almost B&W. 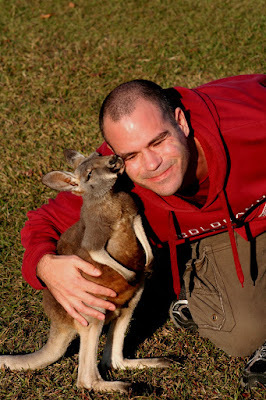 Skippy the human-reared baby red roo gives me a kiss! 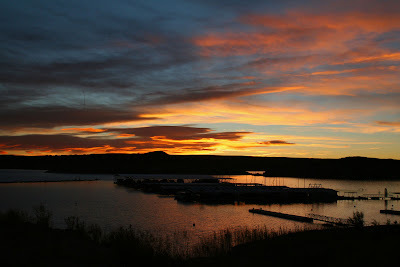 Finally I got around to putting up more photos from our cross-country road trip! 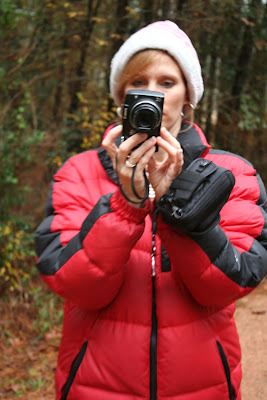 After Gatlinburg and the Smoky Mountains, we headed to the Northshore of Louisiana. 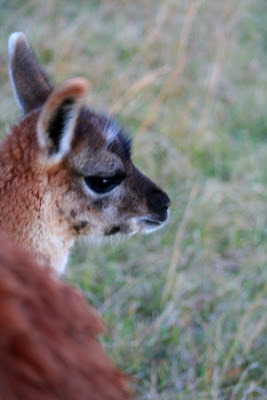 Today I'll post photos from the Global Wildlife Center because it was such an awesome part of the trip! In a day or two, I'll post pics of the other parts of Louisiana's Northshore including an awesome swamp eco-tour where we saw gators! The idea for my visit to this area started because Renee Kientz from the St. Tammany Parish Tourism Commission emailed me about a story idea she had for my Animal Planet blog. 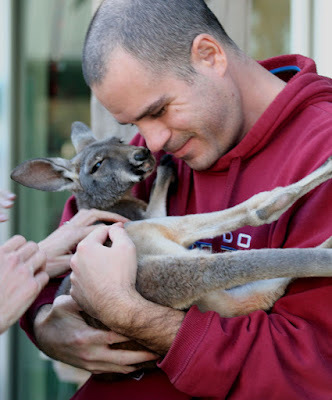 It was about a woman raising a baby kangaroo on her own, which had been abandoned by its mom - and has since been covered by the Today Show, the Washington Post and others. (And you can watch an endearing slideshow of his life so far here). I thought it was a great idea, and she invited me to come visit the Global Wildlife Center and meet Skippy the baby kangaroo firsthand. It took me a few months to get there, but it was well worth it! 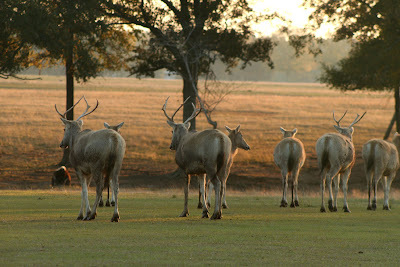 The Center is a 900-acre wildlife preserve with around 4,000 animals, run by a nonprofit. They offer tours on either single-vehicle Pinzgauers - a Swiss Army vehicle (which we took) - or these other multiple-vehicle train-like things. 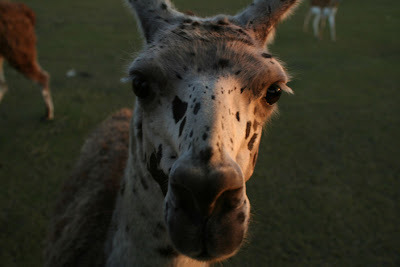 Either way, you get up close and personal with the animals, and they're awesome! 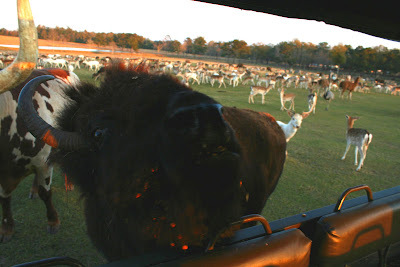 I've been to Fossil Rim Wildlife Center in Glen Rose, Texas but that was a self guided auto tour and you don't really get to touch and interact with the animals like you can at Global. I highly recommend this especially if you love animals or have kids! So on to the photos! 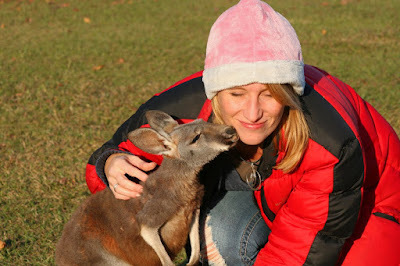 Before we went on the tour, we got to meet the star of the show at the moment - Skippy! I have a blog post coming out about him tomorrow so be sure to visit my Animal Planet blog! He's 10.5 months now. He loves to give kisses! Doug got to hold him. He gave me kisses too. What a sweetheart! Our tour starts and I started taking photos. 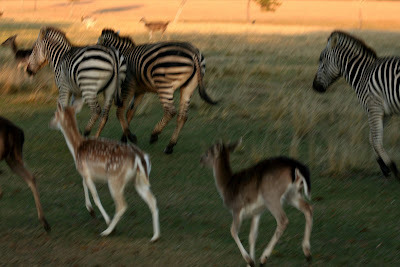 We saw some zebras first. All the animals are together, pretty much. The lady who raised Skippy as his mom, Christina Cooper (who is the Education and Development Director), said that during Hurricane Katrina they were worried to death about the animals but when they looked out of doors, they saw the animals had all huddled together in one giant circle and everyone survived. Amazing. 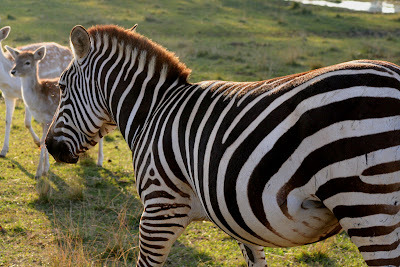 I have always thought zebras are so beautiful! Look at those big brown eyes! The first big animals we came across were these Bactrian camels. 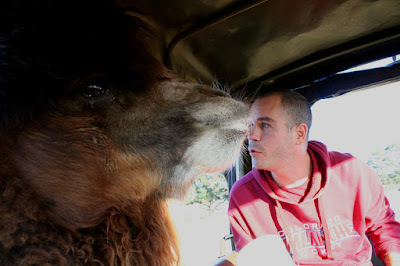 They have two humps and are very furry-faced. There are wild Bactrian camels living in the Gobi desert which are genetically and behaviorally distinct from the many domesticated Bactrian camels. I wrote about them for the Planet Earth animal guide profiles I wrote - so you can read more about the species there (under the Desert episode). They are gentle giants! Love this pic. They would just reach their faces right into the Pinzgauer and munch away on the corn right out of the big bin as well as the buckets we fed them from. They kept bumping their heads on the top of the vehicle. LOL! 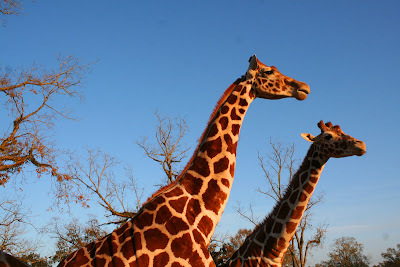 Next we came across the giraffes, which just loved the corn and us! They were so cool. We could pet their heads and faces and shoulders. They have the coolest lips! And though a few times they bumped their heads, they were very aware of where their heads and horns were, and would bend their heads when they took them out of the vehicle, more so than the camels. 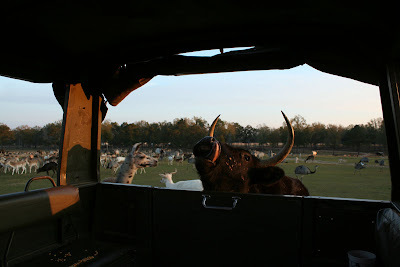 You can see the big bin of corn inside the Pinzagauer (vehicle) which we fed them from in this shot. I love this photo! Look at that face! One of these is a young un. Another gorgeous shot of the giraffes. I'm not 100% sure but I think these are the Pere David deer, a highly endangered species that bred very well here on the reserve. Where are all the animals running to? It's feeding time! 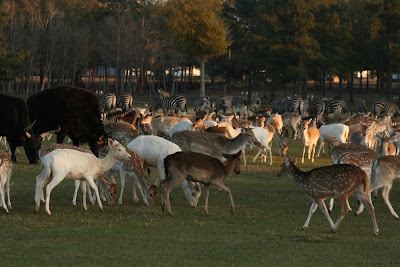 Just before dusk, when the temperature starts cooling off, the staff start supplemental feeding of the animals. They put all the corn in a big spiral and pretty much everyone comes together to chow down! 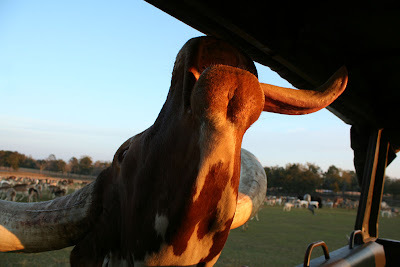 The preserve has a few Watusi and longhorn cattle and they would come over, stick out their grossly long tongue and open their mouth wide. They practically inhaled the corn! On my Facebook profile status, while there, I wrote that I was being chased by a wild beefalo! This was the crazy beefalo that was chasing me (well tecnically chasing after the vehicle with the corn in it...). A beefalo, so I learned, is a cross between a cow and a bison. The cross-breeding occurred naturally at the center. Here it is again, in the back, and it wouldn't leave us alone once we fed it. 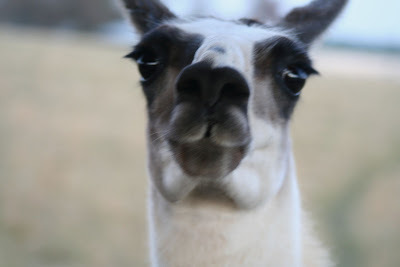 We had to drive off to the llamas, to learn about the "llama drama" to get away from it (not that driver Christina minded but it was seriously starting to freka me out, especially when the ginormous longhorns and beefalo were all surrounding us! The bison were pretty tame in comparison. 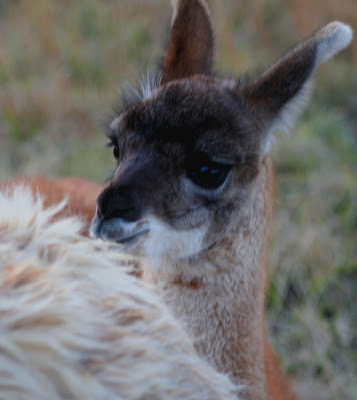 Another shot of the baby llama.